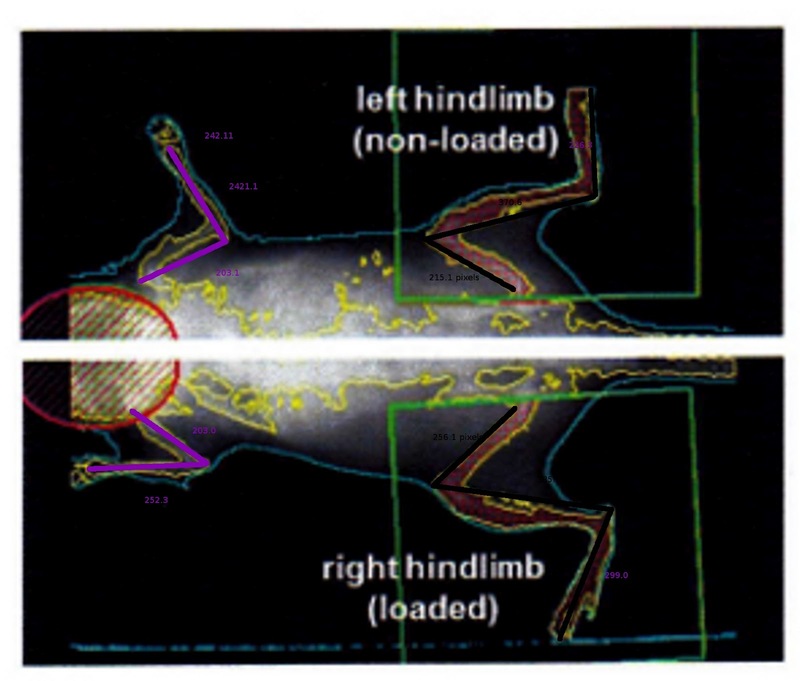 The study is Knee Loading Stimulates Bone Formation in Tail-Suspended Mouse Hindlimb. It was extremely difficult to make accurate measurements but there does seem to be an increase in bone length between the right hindlimb and left hindlimb legs versus arms. The knee loading was 1N per 5Hz for 5 minutes a day. This was taken on the eighth day. Mice were female and 12 weeks old. Loads were 3 min/day at 15Hz with 0.5N force. 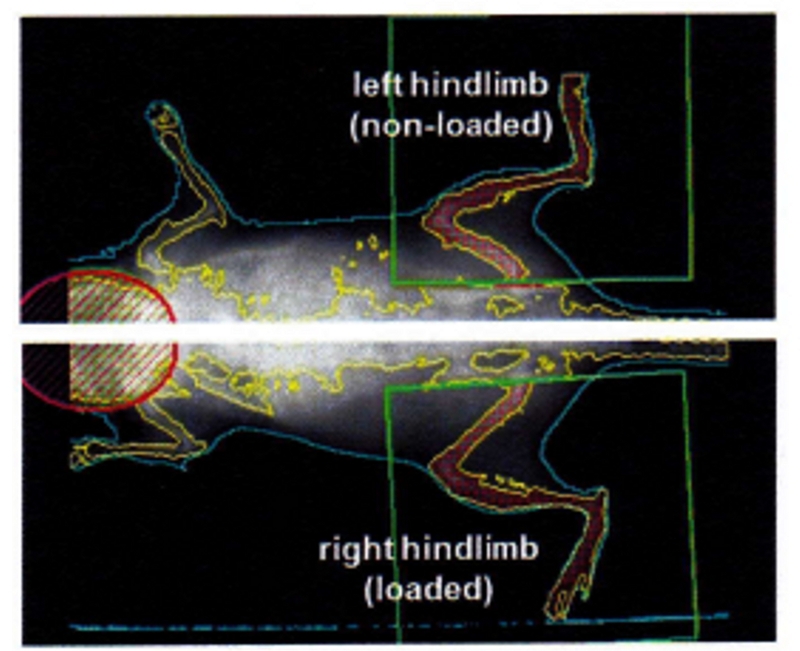 Mice were 14 weeks old with a surgical drilling hole induced. LSJL was only applied for 3 consecutive days. The mice used were an inbred mice strain which have genetic and phenotypical homogeny. There's a confounding factor of different angles being used between group A and B. Also different limbs on the same mouse were used. So it's possible that any differences in length were natural. In Group B Week 3 the femoral epiphysis is heavily tilted so it's difficult to extrapolate any data from that. In Group A between Weeks 2 and 3 the femoral trochanter is bigger yet the femoral neck is smaller. "A round surgical wound (0.5 mm in diameter), penetrating the anterior and posterior surfaces, was generated at a site ~ 7 mm proximal to the distal femoral end (50% along the length of the femur). For the surgical wound in the femur neck, 5-mm longitudinal skin incision was made over the back of the hindlimb. 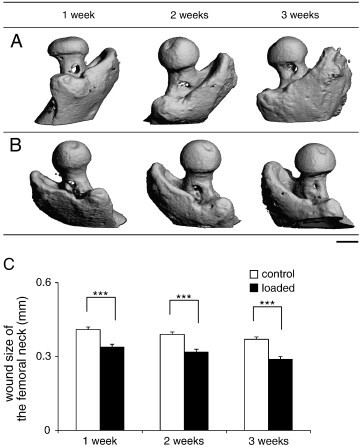 A hole of 0.5 mm in diameter was generated at the middle of the femur neck on the posterior cortex and the anterior cortex. "<-So the wounds were applied homogenously across both bones. "The observed pressure amplitude (half of peak-to-peak) in the femoral bone cavity ranged from 3 to 130 Pa depending on the loading conditions (0.5 to 4 N at 0.5 to 50 Hz)"
With knee loading, bone drilling was found to inhibit bone formation in the diaphysis but no necessarily the epiphysis. And the femoral neck does seem longer in group B than group A. Because of the angle shifts, it's extremely difficult to detect any length difference but there does seem to be one. If the length gain was due to LSJL we'd expect there to be little increase in length between 1 and 3 weeks as no more LSJL was performed in the femoral neck. But we'd expect a different between Groups A and B at 1 week. Unfortunately because of the angle difference there's no real way to measure between the two. But in the first study there seems to be a length gain and there may be in the second. "Knee loading was 1N per 5Hz for 5 minutes a day" Does this mean that 5 minutes is the optimum time to load? 1N for mice would translate to what amount of weight for humans? Can LSJL work on adults?